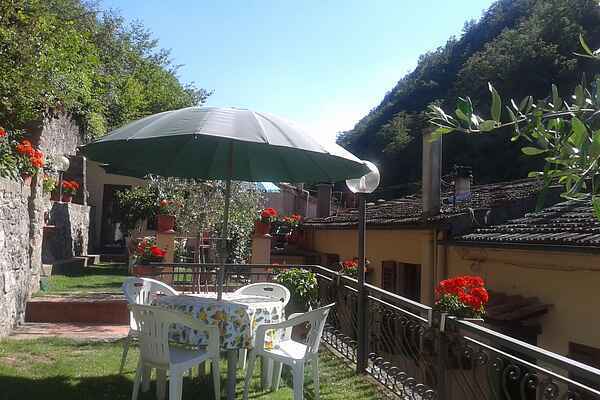 This cottage is located in the village of Paterno that is very peacfull and relaxing and at the same time very close to Florence. Paterno is slightly higher than the city, so even with high summer temperatures it's lovely to sit on the terrace with a book and a drink. The owners Laura and Roberto will provide you with all the information you need and offer you many delicious meals if you wish, for "Aunt" Laura is one of those chefs that you can only encounter in Tuscany. Watch out for Judy, their little dog, the leftovers will gladly be received! Your holiday here will consist of walks in the hills of Tuscany and trips to different cities that are well reachable from Paterno, most of all, Florence which is 20 min. away. From the living room of this cottage you look out at the small stream along the street. This accommodation is not suitable for people who have difficulty walking because the house, the patio and the street are all on different levels. Monte Morello is the highest known Fiorentino mountain. It is located about 2 km from the house and is between the towns of Vaglia, Sesto Fiorentino and Calenzano. The mountain range has a curious shape, each of the three peaks have the typical appearance of the tops of volcanoes. But the form must not be misleading, because the nature of these mountains is absolutely not of volcanic origin. It's amazing how a few minutes are sufficient, to find yourself in a mountain landscape, with meadows, oak cypress and pines.